Demand for gas in the UK is believed to have hit a new record on Thursday as people attempt to keep their homes warm through the severely cold weather. The National Grid estimates usage will reach 455.3m cubic metres. The current record is 449m cubic metres, set on 7 January 2003. 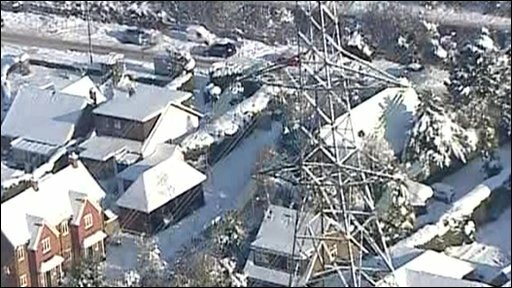 The National Grid has had to issue its second alert in three days, asking suppliers to provide more gas. Some factories have also been asked to switch from gas to other power sources. Around 200 industrial users in the North West and East Midlands are on what are known as interruptible contracts. They pay a reduced price for power on the understanding that if demand gets too high they will cut their gas use. For the first time in 10 years, 94 of them were asked to switch to other power sources on Thursday. On Friday, that figure will drop to 27 companies. "Whilst it is easy to say 'I told you so', the fact is we have been warning of such interruptions for a long time and the need for urgent investment in our infrastructure to avoid them," said Roger Salomone, energy adviser to the manufacturers' organisation, the EEF. The National Grid is forecasting record demand for gas, after 447m cubic metres were used on Wednesday. Part of the reason for the alert - known as a gas balancing alert (GBA) - is that Norwegian gas fields have had a technical problem and have not been able to supply as much as they promised. That led to a shortfall of 52m cubic metres of gas, but the system is now back up and running. The GBA asks energy suppliers to sell more gas into the system. The Energy Intensive Users Group said it was "unprecedented" to have two such alerts in a week, although it added the system was working. "We shouldn't overreact," its spokesman Jeremy Nicholson told BBC News. "It is a wake-up call to the market... and it does seem to be working. "But it indicates too that we are running our system pretty hard, there is not much slack in it, not much insurance there, partly because we don't have enough storage."